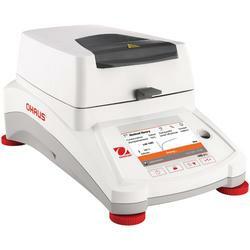 Ohaus Moisture Analysis Made Simple and Powerful Combining Speed and Precision in One Moisture Yes Tag Line Analyzer Delivering functionality and precision you can rely on—and so easy to operate and clean, you can test more samples in less time! Advanced functionality. Precise results. 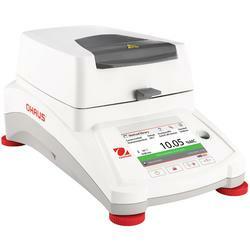 Your first choice for moisture analysis, from your lab to the factory floor. Delivering functionality and precision you can rely on—and so easy to operate and clean, you can test more samples in less time! Uniform drying for precise, repeatable results of 0.01% readability. - The unique reflective sample chamber ensures uniform heating of each sample—so you can count on getting the same result every time. Fast heating to minimize testing time. - Halogen heating technology begins drying each sample in seconds and performs up to 40% faster than traditional infrared methods, for higher throughput and a more efficient work day. Flexible and powerful enough for a wide variety of sample types. - Features a full operating temperature range of 40º-200ºC (MB90) or 40º-230ºC (MB120) in 1º increments. 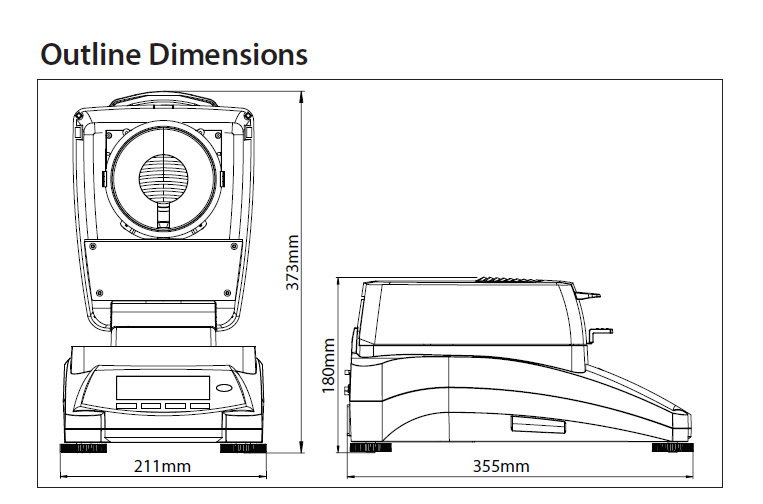 The MB120 has four drying profiles for precise temperature control to ensure accuracy. - Customize heating for specific samples for one-step drying without the risk of sample degradation—from wastewater to grains to plastics. Just set temperature and time and begin! The MB Series features a patented pan handler and removable parts that make cleaning quick and easy. No tools required! Moisture analysis made simple—just three easy steps for routine sample testing! Press start and see your results! The MB120 delivers functionality and precision that you can rely on, and is easy to operate and clean—you can test more samples in less time! Advanced features such as a temperature guide help to analyze optimum drying temperature, and methods and results storage allows statistical analysis of measurements. Three levels of user management ensure data safety—set up and lock temperature settings and method parameters with administrator access. Advanced Functionality for Professional Moisture Analysis MB120’s Temperature Guide analyzes a sample and determines the optimal drying temperature. Store up to 100 drying methods for easy recall and up to 1000 total results for statistical analysis. Easy Tool-Free Cleaning and Intuitive Operation with the Icon-Driven Menu Navigation The MB120 features a removable pan handler and sample chamber for easy cleaning. Operating the MB120 is intuitive—simply follow the guided instructions on the touchscreen display. The robust housing and die-cast base guarantee durability. Test a wide variety of materials for a range of applications with MB120. Temperature Guide Easily analyze a sample of a specific material and determine the optimum drying temperature. 100 Methods Library Makes Testing Faster Program the parameters for up to 100 different types of samples, then select and run your test with the push of a button. Store Up to 1000 Results for All Methods for Statistical Analysis Quickly retrieve data and save to flash drive. Testing Made Simple The MB Series features a wide, bright touchscreen display and intuitive menu navigation for fast, accurate moisture analysis. Moisture Analysis Made Simple Just 3 easy steps for routine sample testing! Exceptional Precision The MB120 provides precise results for more confident testing. Fast Halogen Heating Technology Halogen heating dries samples in seconds and performs up to 40% faster than traditional infrared methods. Uniform Drying for Precise, Repeatable Results The reflective sample chamber ensures uniform heating of each sample to yield reliable results of 0.01% readability. 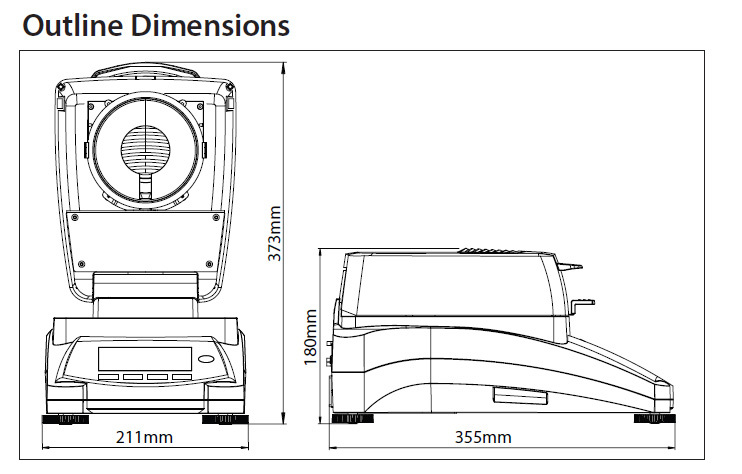 Flexible and Powerful Features a full operating temperature range of 40–230 °C in 1 degree increments. Shut-Off Criteria for Automatic Test Completion Customize your own test endpoint criteria to automatically end the test once moisture loss is no longer detected. Choose from 7 criteria—Manual, Timed, AutoFree percent weight loss per second, AutoFree mg loss per second, A30, A60 and A90. Easy Tool-Free Cleaning The MB120 features a patented pan handler and removable parts for convenient maintenance. Measuring moisture content has never been easier than with the MB90 Moisture Analyzer. The MB90s halogen heating distributes heat uniformly over the sample and speeds up the drying process— delivering fast and precise measurements. Designed for tool-free cleaning, the MB90’s components can be easily removed for quick and easy maintenance. Operating the MB90 is intuitive with the icon-driven menu navigation on the touchscreen display. Outstanding Halogen Heating Guarantees Fast and Precise Results The MB90’s precisely controlled halogen heating dries samples quickly and ensures uniform heating to yield fast, precise and repeatable results of 0.01% readability. Effortless Maintenance with the Tool-Free Cleaning Design Designed with effortless maintenance in mind, the MB90 features a removable pan handler and heating chamber components that make cleaning quick and easy—no tools needed. Touchscreen Icon-Based Menu Navigation Guides Users Through Every Step Icon-based menu navigation on the easy-to-read touchscreen display makes operating the MB90 intuitive. Perform routine sample testing in three easy steps—no training required. Exceptional Precision - The MB90 provides precise results for more confident testing. Flexible and Powerful Features a full operating temperature range of 40–200 °C in 1 degree increments. Two Drying Profiles to Ensure Accuracy Customize heating of specific samples with temperature control for one-step drying—set temperature and time and begin! Shut-Off Criteria for Automatic Test Completion Customize your own test endpoint criteria to automatically end the test once moisture loss is no longer detected. Choose from 3 criteria—Manual, Timed and Auto. The MB90 features a patented pan handler and removable parts for convenient maintenance. The MB90 features a wide, bright touchscreen display and intuitive menu navigation for fast, accurate moisture analysis. Just 3 easy steps for routine sample testing! Versatile connectivity options to handle data collection and transfer needs—enhancing the user experience.